There have been so many books about LGBT lives cut short, and promising, even flourishing, careers upended by AIDS and other tragic circumstances that when a book like this comes along, it’s kind of a cause for celebration. Here is a life from before birth to the author’s late-70’s. It is a good-looking, apparently healthy, active (he’s in a pool or pond), smiling senior pictured on the cover. Inside are batches of B&W photos going back to the early 1940’s, of families, farms, students in groups, young visitors in foreign lands, etc. This is a volume I would recommend to any millennial wondering where the past she can look to is and searching for a gay person she can admire. Because both are here. Good luck and connections have to be allied to intelligence, ability, and ambition for one to become successful in life. Young had all of it. His background couldn’t have been more humble—his parents were chicken farmers in the Catskills in rural New York State. His early scholarship got him into the Little Red Schoolhouse, a bastion of communism in the 1950’s. Yet he ended up in an Ivy League college, and his abilities and his interest in Latin America at Columbia University slid him into several graduate programs in the U.S. and abroad leading to important work–appointments in Brazil, and even reporting on the newly communist Cuba. Young describes all the ins and outs of ideological shifts vs. political constancy he both underwent and witnessed in that troubled time, as well as the personal connections he made and the work he eventually got as a journalist in Washington, D.C. It could be said to be a meteoric rise. Slowly it all shifted for Allen as it did for so many of us. Because even before the Stonewall Riot of 1969, he was grappling with not being heterosexual and that amazing protest brought it all to a head for him, as it did for so many others. Young joined the instantly formed Gay Liberation Front, which he accurately characterized as the “favorite hang-out of the freest of the gay people—those most likely to be labeled fag or drag queen —.” He never regretted it. The GLF was succeeded by the Gay Activist Alliance which had one focus, the abolition of all anti-gay legislation, which eventually succeeded. 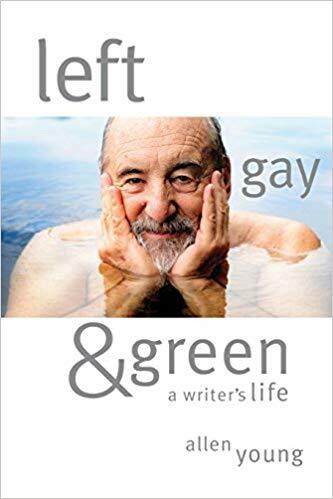 Within a few years, he and another member of that group, literature scholar Karla Jay, were putting together anthologies collecting the work of LGB authors who’d already written on a variety of subjects. Those books haven’t really been surpassed in their Gay Lib credentials, or in their range. Out of the Closet: Voices of Gay Liberation and After You’re Out became drugstore rack paperbacks that appeared all over the U.S. ensuring their influence for a generation. Their Lavender Culture followed and each has since published a half dozen books. While all that was happening, another Sixties movement attracted Young: the commune. Starting in various urban communes—and believe me there were plenty in Manhattan and Boston alone—he and several friends ended up purchasing a large piece of property in central Massachusetts. In order to remain there and continue building what eventually became Butterworth Farm, they had to find local work. Some became realtors in formerly abandoned New England mill towns, and then even politicians in those towns. The visually brilliant Carl Miller became a fabric designer who quickly rose to the top of his field. Young became a reporter for the local paper, The Althol Daily News, and when that work slowed down, he became the publicity arm of the area hospital. Reading about these men and other farms and communes is like reading another entire volume. More recently, the land of which he is a co-guardian, as well as the lands around those acres have become a prime focus of Young’s activism. The Quabbin Reservoir and its surrounding wetlands have become a crucial locus of his and other ecologists’ concerns. Equally so, is retaining the established nineteenth century character of the mostly rural villages and towns in that area. Attempts by various industrial-commercial complexes to invade and alter that landscape have been staunchly resisted, but threats continue. His is a full life, including friends, family, work relationships, and a long-time partnership. I met Allen Young at an early Gay Pride March in New York, I’ve stayed at his wonderful “Octagon House” at the farm, swam in those ponds, and pools, hiked those same hills, and shared in some of his great losses and in his successes. Even so, reading this book, I learned so much I didn’t know about his roots, his youth, and those around him, and even the times we shared. Obviously a “reporter” covering so much space in time and place can’t go as deeply as someone writing a more focused text. But there will always be a place on my bookshelf for Left, Gay & Green and I hope on yours too.